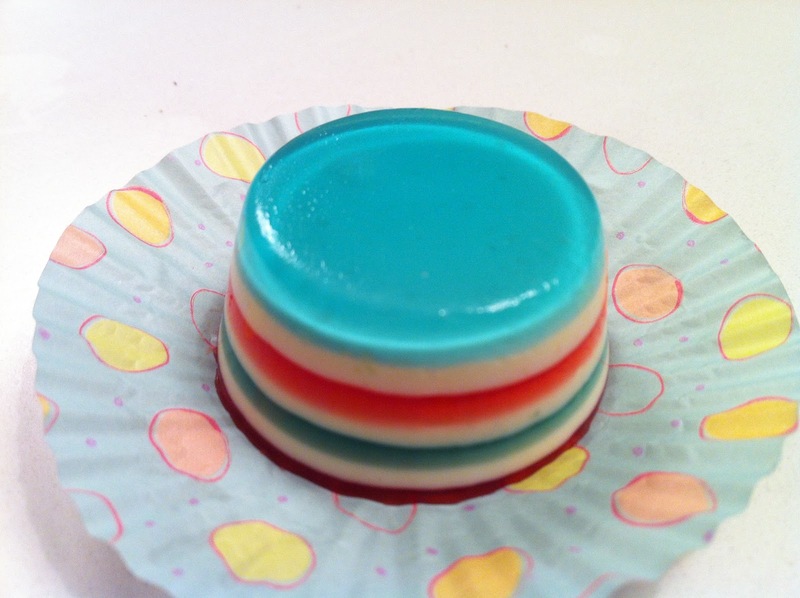 red, white, and blue jello | what is clara eating today? I have used silicon mini cupcake pan so it will be easier to pop out the jello. For each color, prepare by dissolving all the ingredients in hot water (cold cream), then add the cold water (cold cream). spoon in 1/2 teaspoon of blue gelatin mixture into the cavities of prepared muffin pan. refrigerate until set but still sticky on top. repeat with other colors in the order of white, red, white, blue, white, red. it is important to pour the next color when it is sticky to prevent the layers from separating. each layer takes 2-4 minutes. check frequently. when the last layer is done, wait until the top is firm (maybe another 30 minutes), pop out each jello and store them in air tight container in refrigerator. i find it easier to remove without damaging the shape when i remove it at this time than to wait until everything is completely set.